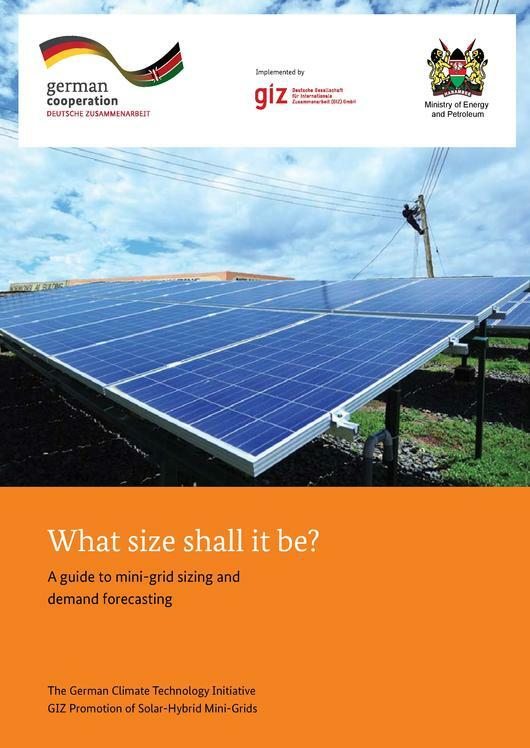 The 'Mini-grid sizing guidebook’ aims at providing a quick understanding of the ruling principles of electricity demand assessment and mini-grid system sizing. For the successful implementation of mini-grids in rural areas, adequate load assessment and demand forecast, as well as subsequent system sizing, are essential. The economic viability of mini-grid projects depends on the size of the installed assets - and thus the investments - which need to be backed by a payable demand in the years after commissioning. A wrongly configured system (e.g. too small or too large) will either not serve its purpose or not recover the cost required to set it up. This guidebook is divided into four chapters. Chapter 1 gives a basic introduction and overview about sizing mini-grids. Chapter 2 describes the sizing procedure for mini-grids, including a description of required data and information. The methods for the assessment of energy demand are explained in detail, and the correction of the assessed demand to the effective demand is discussed. Furthermore, forecasting energy demand and recommendations on system sizing are addressed. Chapter 3 gives an overview of existing system sizing tools, focusing on the mini-grid builder and HOMER (Hybrid optimization of multiple energy resources). Chapter 4 entails a conclusion and some final recommendations to users of the tools and handbook. solutions”. Presentation given in Manila, October 2015. HOMER (2016): Homer Energy Support Knowledgebase. IEA (2015): World Energy Outlook 2015. International Energy Agency, Paris, France. IEA (2014): Africa Energy Outlook 2014. International Energy Agency, Paris, France. This page was last modified on 26 June 2018, at 17:30.